1) If you’re planning to take a cruise, be sure to ask in advance about smoking restrictions. 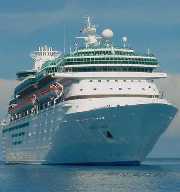 Among the latest to extend no smoking rules is Royal Caribbean International. According to Fodor’s Travel Wire, in January 2008 the line will no longer allow smoking in guest quarters in 18 of its 21 ships. Smoking will continue to be OK in designated areas of some bars, on balconies, and starboard outer decks. 2) News surfaced on Wednesday that the House is considering its own version of the Senate’s proposed 20,000 percent cigar tax hike. Instead of charging up to $10 per cigar in federal taxes, the new bill would put the cap at $1 and does not include a tax on inventory. I guess that’s good news. Sort of. 3) Well, the anti-smoking zealots have already gotten to Churchill and Tom and Jerry; it was only a matter of time before Mickey went smoke-free too. Disney’s chief executive announced this week that the company would be eliminating smoking from its films, as well as discouraging the act under its two other labels: Touchstone and Miramax. Is the best way to deal with an issue to censor it? 4) Around the Blogs: Keepers of the Flame lights up an FP Habano 98. Stogie Fresh smokes a Camacho Triple Maduro. Stogie Review fires up a Cuba Aliados. Cigar Jack tries a “JFR” Coronoa Gorda. Velvet Cigar smokes a Toraño Reserva Selecta. Cigar Beat reviews an Oliva Serie V. Cigar Monkey goes with the Ashton VSG. 5) Deal of the Week: If you’re looking to add a small humidor to your collection (maybe for the office?) or looking for a good starter humidor, this deal is for you. For just $40, you get a Mahogany humidor, humidor solution, cigar cutter, a Camacho hat, and 25 cigars. And with sticks by Perdomo, Oliva, and Camacho, the cigars alone are worth the price. Pick yours up here. Among the various recent smoking bans being implemented around the world, the Royal Carribean ban would be the least of my concerns as a cigar smoker. Who on a cruise is going to sit in their room and smoke when there are plenty of bars, lounges, and best of all, open decks, on the ship where you can enjoy your sticks? Does anyone know when they plan to vote on the House cigar tax hike bill? It's not a standalone cigar tax, it's part of the "CHAMP Act" which permits families with incomes up to $82000 in some states to qualify for the low-income health insurance benefit and also cuts some social security benefits for seniors. The bill was reported by the House Ways and Means Committee last night around 2 AM and although the Energy & Commerce Committee failed to report it out today it is expected to be on the House floor sometime next week before they begin their August recess. Абсолютно вас поддерживаю, мы с вами одинаково мыслим.